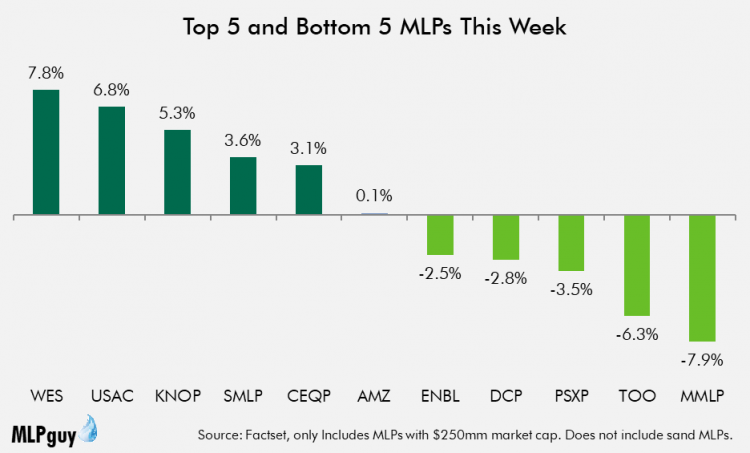 Midstream and MLPs were unchanged on the week, but finished strong along with the rest of the energy sector after the mega-merger announcement by Chevron Friday morning. This week's Enterprise analyst event in Houston was well-attended and on brand. 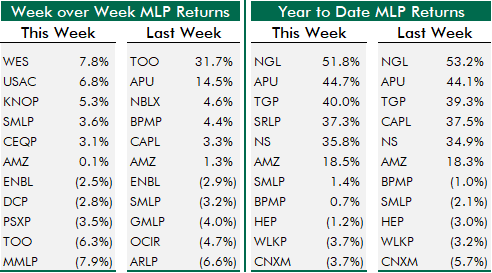 WES led all MLPs this week with a 7.8% gain, all of which came on Friday after the mega merger announcement involving its sponsor APC. Among the midstream corporations, TGE was the leader, supported by what appears to be additional unit purchases by new GP owner Blackstone Infrastructure Partners. 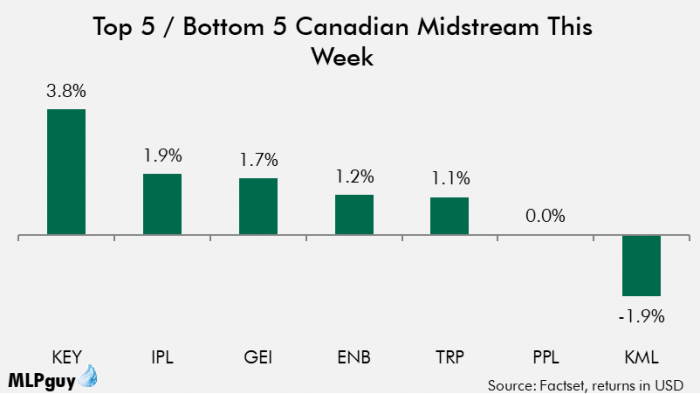 In Canadian Midstream, smaller names outperformed this week, but the skew in performance across the group was small as usual. Midstream and MLPs were unchanged on the week, but finished strong along with the rest of the energy sector after the mega-merger announcement by Chevron (NYSE:CVX) Friday morning. The stock market and utilities were slightly positive week over week. Oil prices edged up and are up 40%+ this year. NGL prices have not kept pace with oil prices, especially light NGLs, but propane and ethane rallied this week. This week's Enterprise (NYSE:EPD) analyst event in Houston was well-attended and on brand. EPD compared itself to Amazon (NASDAQ:AMZN), connecting sellers with buyers, supply with demand from basin to dock. "Petrochemical midstream services" is a major focus area for the company. EPD also had some fresh environmental and sustainability metrics in its presentation that shows leadership on those factors, even as the governance part of ESG remains lower-cased "g". On the financial side, EPD indicated corporate conversion is not imminent, but it will remain under evaluation. Buybacks will be opportunistic, but hard to justify with capital being so precious in the current environment. However, distribution acceleration is possible after the latest round of growth projects. On the MLP 2.0 business model, Randy Fowler's summary resonated: "We have been pursuing a soft landing into a more traditional financial model the last few years vs. the hard landing for some other folks." In 2009, Jim Carrey starred in the film "Yes Man". It was the culmination of a trilogy of silly premised films starring Jim Carrey that grossed a combined $1.0bn at the box office (Liar Liar and Bruce Almighty were the first two). Yes Man only grossed $223mm. In case you don't remember the premise, Carrey's character was stuck in a rut, depressed because he said "no" to things and never tried anything out of his comfort zone. At a self-help seminar, he is convinced to say "yes" to everything (unlike in "Liar Liar", apparently there is no magic involved). He finds adventure, happiness, and of course, love. There's been a lot of negativity spewed about MLPs and midstream on the Internet this year, much of it deserved. And we can get back to calling out bad actors when some of these lingering IDR structures inevitably get resolved to the detriment of L.P. holders or some other poor governance event that destroys L.P. value or leads to major tax bills for L.P. holders. Western Gas (NYSE:WES) positive reaction to sponsor acquisition helped by savvy commentary on the merger conference call calling out WES in a positive light. In each case, some leap of faith was required, and the market appeared willing to make it. These could be one-time, unique events, and I could just be getting caught up in the market's mania following the big M&A announcement Friday. 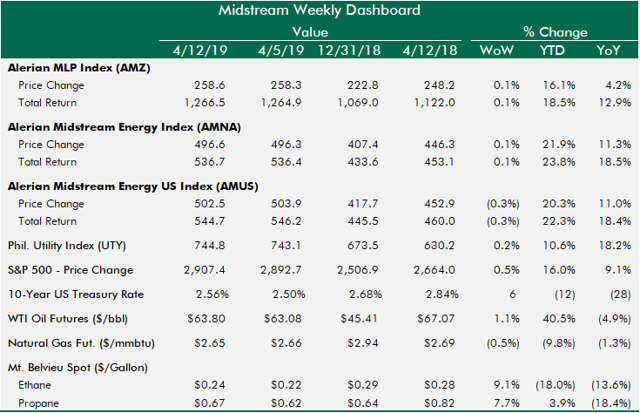 But it is also possible that announcements this week woke up a broader set of investors to some positive potential in midstream that leads to follow through when the broad market says "yes" to energy and midstream stocks. WES led all MLPs this week with a 7.8% gain, all of which came on Friday after the mega merger announcement involving its sponsor APC. USAC was steadily higher all week and finished second best. CEQP's consolidation of its Jackalope JV with WMB was well-received by the market. SMLP went from bottom 5 last week to top 5 this week. No other notables week over week. On the YTD leaderboard, SRLP moved into the top 5, which is now wholly comprised of 35%+ return stocks. The bottom 5 remained largely unchanged, but now only includes 3 negative total return stocks. While there was no other news among the group this week, the reports that Occidental (NYSE:OXY) was pursuing APC and submitted a higher nominal bid than CVX may have removed some speculative interest in KMI that OXY might be a buyer of the CO2 business (which KMI denied being for sale). 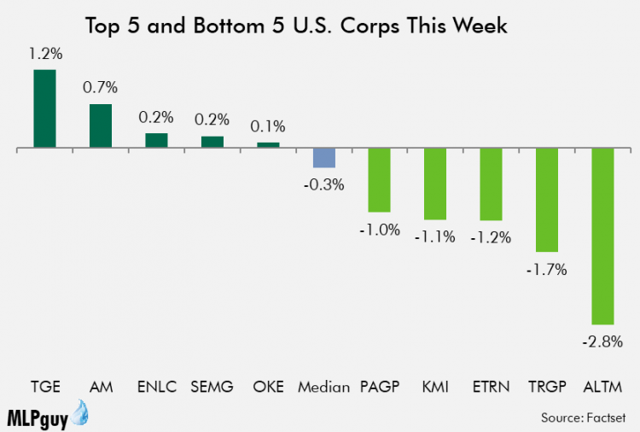 In any event, the weakness in KMI was quite small over the course of the week, so it could have just been profit taking or generalists rotating into E&P companies after the display of animal spirits from Chevron on Friday. AM and SEMG repeated in the top 5, while TRGP and ETRN repeated in the bottom 5 week over week. 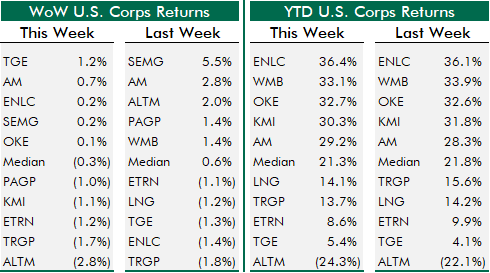 ENLC held its overall lead YTD, followed closely by WMB, OKE and KMI. In Canadian Midstream, smaller names outperformed this week, but the skew in performance across the group was small as usual. No news up north, but generally positive oil prices were broadly supportive of energy stocks in Canada. Still no news on Kinder Morgan Canada, but perhaps this week when KMI reports results there will be an update. On the YTD leaderboard, the entire group has produced 20%+ total returns in USD (outside of KML, which is waiting for a direction). ENB fell off the torrid pace of the other names earlier this year on the Line 3 delay but has recovered recently.